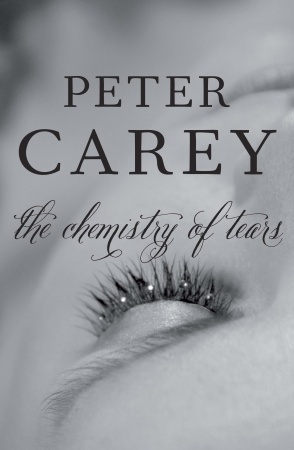 A woman I met at the Peter Carey event in Toronto Library’s Appel Salon told me that she loved Peter Carey’s books because of his beautiful way with language. I told her I had read only the first few pages of The Chemistry of Tears, and that I was enjoying it so far, to which she replied that the rest of the book was nothing like that. The first chapter, about museum conservator Catherine Gehrig finding out her married lover had died, barely touched the surface of Carey’s prowess with words, and when the story really gets underway, the language becomes practically breathtaking. The woman I met was right — Carey has a unique way with language. The language didn’t transport me, as it had transported her. To be honest, I think after a while, it just felt indulgent to me, especially as the heroine, Catherine, wallows in her grief in a particularly loquacious, poetic way. Still, indulgent for some, breathtaking for others. Chemistry is about grief, and how people can deal with it. For Catherine, whose relationship with her lover had been a clumsily kept secret (in the sense that everyone apparently knew, even though they had to keep up appearances of not knowing), she immerses herself in her work, which means investigating a mechanical swan from the Victorian era. In a particularly poignant moment, she emails her boss that “it was highly ‘inappropriate’ to give a grieving woman the task of simulating life.” The boss clearly means well, and Catherine later does find solace in the task, but the irony of the assignment is indeed painful. Parallel to Catherine’s story is Henry’s, the 19th century man who commissioned the mechanical swan. He had actually commissioned a mechanical duck, a treat for his dying son, but the inventor decided a mere duck wasn’t quite grand enough. As with Catherine, Henry has to deal with the loss of a loved one — his son is dying and he can’t stop it. The creation of a mechanical bird is a lovely, but ultimately futile, gesture. Henry’s story had potential, but it never came to life for me. He travels to find someone who can create an automaton for him, and there are some fairy tale type scenes where he meets colourful characters who warn him about other shady figures. This is where, I suspect, I could have been transported by the language. Unfortunately, I just found the story meandering. Part of it is that I knew how it would turn out — we have Catherine in the 21st century reading Henry’s journals and working on Henry’s swan — so Henry’s anxiety over his automaton lacked urgency for the reader. Also, however, Carey seems to be attempting to infuse this storyline with an almost otherworldly air, and yet doesn’t quite succeed. It’s a different world, but not one that captivates, and so instead of being caught up in Henry’s adventures, I wanted to get back to Catherine’s. Catherine’s story was a bit more interesting. Her pain in struggling to keep it together is palpable, and her snappishness and mood swings realistic. Along with reading Henry’s journals, she is obsessed with deleting her lover’s emails to her from his work computer — why they communicated such intimate material on their work emails rather than their personal ones is a minor irritant that I still don’t get. This preoccupation is endearing, and even though, as a character later points out, there are far more efficient ways to go about the task, I can understand Catherine’s desire to draw it out, turn the email deletion into a ritual that keeps their relationship going for as long as possible. Catherine’s grief does feel indulgent after a while, and I think it struck me as such because Carey’s narrative indulges itself in her thoughts and emotions. We as readers barely get relief from her pain, and what little distraction there is — her work on the mechanical swan, or her conversations with her lover’s family — is so intricately linked with Catherine’s grief that it compounds rather than distracts. I can certainly understand the overwhelming nature of grief — I just thought this book tipped over the line. The secondary characters were compelling. Catherine’s boss is kind and understanding, the kind of boss people probably wish to have until he reveals certain secrets about himself. Catherine’s assistant is a psychological loose cannon, but highly intelligent and in certain ways, more intriguing a character than Catherine herself. The Chemistry of Tears had promise, but the book never really took off for me. The cover design is absolutely beautiful — one of my favourites this year, and certainly representative of the lyrical emotionality of the text. The story had some powerful elements, yet didn’t have a powerful overall impact. Carey uses a mechanical swan as a symbol and focal point for life, death and loss, a potentially potent symbol, yet not compelling enough an object in this book to make me care.